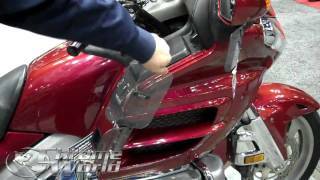 Our GL1800 Wing Deflectors™ are designed for one thing only: two-wheeled climate control. Whether it's managing Summer heat or Winter chill while riding your Wing, National Cycle has the solution that's great looking, rugged, and easy to install! 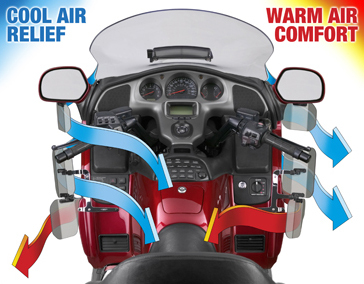 National Cycle's Wing Deflectors™ allow maximum temperature control of warm or cool airflow toward or away from the rider. Get cool air relief in the summer, and warm air comfort in the winter! Exclusive swivel ratchets give the rider easy, independent adjustment of each wing by simply grasping them and rotating to the desired angle. 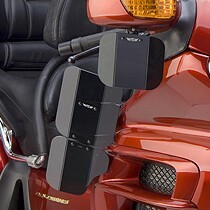 Put them at the angle you want and they'll stay there – even at 90MPH! One-piece, chrome plated steel brackets are designed for maximum strength and easy installation using the OEM threaded inserts under the bike's fairing strips. Plus, they're also covered by National Cycle's exclusive 3-Year Warranty against breakage! Wing Deflectors™ are available as Fairing Mount Sets and Mirror Mount Sets, in either Light Tint or Dark Tint polycarbonate. 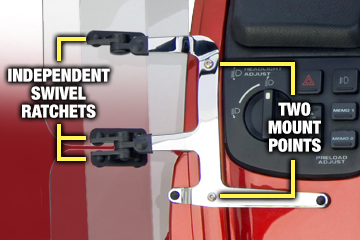 Made from FMR Hardcoated Lexan® Polycarbonate with Chromed Steel and Stainless Steel mounting hardware.